Graham Bonnet is one of those legendary names in rock music. The former frontman of Rainbow, the Michael Schenker Group, Alcatrazz etc has just released a new album and completed a UK tour in support of it. 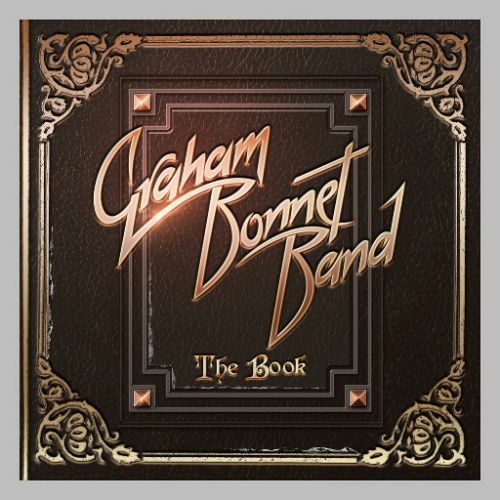 “The Book”, by the Graham Bonnet Band was released through Frontiers on 4th November and contains one CD of new material and one of tracks from Graham’s past that have been re-recorded. I spoke with Graham just before he went on stage in The Limelight in Belfast on 19th November to talk about the new album, future plans etc. NI ROCKS – Hi Graham, thanks for taking some time to talk to Rock Radio NI. You’ve just released a new album and are currently on a European tour that brings you to N Ireland and Ireland for 3 dates in the next week. There are two discs on the album “The Book”. One of new material and one of new recordings of some of your best known tracks. The album was released by Frontiers Music. Had you worked with them before and how did you get together on this occasion? GRAHAM – No, I hadn’t worked with them before. They gave us a new deal and I’m very happy that they did. They’re very interested in what we were doing and I really appreciate what they have done so far. They’ve been really great. NI ROCKS – Where did you record the album and who did you work with for production etc. GRAHAM – We recorded it at home, a lot of it. The drums were done at Mark Zonder’s own studio. Jimmy Waldo put keyboard parts down at his studio too. Most of the other tracks, like bass, lead vocals, harmonies and lead guitar were done at the house. NI ROCKS – Your band features Beth-Ami Heavenstone on bass, Conrado Pesinato on guitar, Jimmy Waldo on keyboards and Mark Zonder on drums. I presume they all worked on the recording of the album in the studio too? Were there any other artists involved? GRAHAM – No, that was about it. That was enough people I think (laughs). NI ROCKS – Were the new tracks on “The Book” written over a period of time or was it a case of getting together in the studio and writing some tracks? GRAHAM – I had some tracks knocking about for three years that I was interested in recording. Acoustically, I had these ideas and then the band added their own parts later on. They eventually put their own ideas into each song to make it a band song as opposed to an acoustic song with voice. That’s the way I’ve always worked. NI ROCKS – The second CD in “The Book” contains 16 of your tracks that have been re-recorded. Did you select the 16 tracks yourself or was that done in collaboration with Frontiers? GRAHAM – Frontiers picked those tracks because they thought those were the most popular tracks that people would know and would like to heaf re-recordings of. It would then introduce me again to the public, because it is usually a band name that goes with those tracks – like Alcatrazz, MSG or Rainbow. This will make people listen and realise - ahh, that’s the guy that sang “Since You’ve Been Gone” and he now has an album called “The Book” and this is his new band. So, it’s kind of cool to reintroduce myself to the public. NI ROCKS – It’s a great album and we’ play a track from it now. Do you want to pick one and tell us a little bit about it? GRAHAM – A song that I like is the single “Into The Night” which is basically about a guy who comes home after being away for a while. He finds that the locks have been changed on the doors and he can’t get in. He wonders why he can’t get in and he rings the bell. Someone eventually comes to the door and he finds out that there’s luggage in the front room of the house and all he’s all ready to move out. His wife is actually divorcing him – so it’s a divorce song! A nice happy one! That’s basically what it is about and I think the words tell the story! NI ROCKS – The band started the current tour almost 2 weeks ago in Spain and you’ve now been through England, Wales and Scotland and played last night (in Derry / Londonderry). How has that been going so far? GRAHAM – It has been going really great and we had a great time in Spain. So far everything has been good – we just had a few technical hitches here or there. No one’s fault, but the gods were against us once in a while. We’ve struggled through. We had nights where strings have broken on guitars, amplifiers have blown up – the usual kind of crap that every band has every day! No – they don’t! We just seem to be a bit jinxed for some reason, and I don’t know why!! But, we’ve got through it and we keep smiling and we’re still alive! NI ROCKS – Any particular highlights so far? GRAHAM – Breathing everyday has been one of the good things! (laughs). We’ve had some great shows. The Hard Rock Hell show was really good and really fun. A nice audience – great audience. Even the smaller gigs have been fun. NI ROCKS – Normally how many of the new tracks from “The Book” would you play during the set? GRAHAM – We do two. We do “Rider” and “Into The Night”. NI ROCKS – Your first gig in Northern Ireland was last night in Londonderry and tonight it’s Belfast before moving down to Dublin. Any particular expectations when it comes to playing over here? GRAHAM – The last time I was here was back in 1968, when I was 19 or something, with my cousin. We were called The Marbles back then and we had a hit record out here called “Only One Woman” – people probably won’t remember it. I got really ill when I was out here. It was a very foggy, horrible time of year and I got really sick. I got bronchitis and we had to explain why I couldn’t do the gigs. I had a doctor’s note and the whole thing! We did a couple of gigs, then I got ill and we had to go home. This is the first visit since 1968 and it’s good to be back. NI ROCKS – The UK tour finishes on 22nd November in Cardiff. What plans does the band have after that? GRAHAM – Then we go home and we’re doing some overdubs for a DVD that we did for Frontiers in Italy. We have that to do and then we’ll probably start working on new songs for another album. Along with rehearsing and putting some new songs together for getting the show on the road. NI ROCKS – I noticed yesterday that you’d announced some dates for Japan (3 dates in March 2017). GRAHAM – Yes, Japan is coming up. We’re going to be working with Jimmy Waldo and Gary Shea, the old bass player from my band Alcatrazz. Jimmy Waldo is going to part of this band eventually, next year. We’re going to be doing a mix and match between our band and their band, playing Alcatrazz, Graham Bonnet stuff blah, blah. We’re going to be interchanging bass players and whatever else. It’s going to be a bit of fun I think. NI ROCKS – You just mentioned another album. I take it that your deal with Frontiers include another album and what kind of timescale would we be looking at? GRAHAM – Hopefully, It’ll probably be done quicker because we had a lot of work to do on the re-recordings on the new album this time. But this will be concentrating on one album; so hopefully by summer of next year. NI ROCKS – There have been a few releases from the archives over the past couple of years. Are there plans to re-release more albums from the back catalogue? GRAHAM – There is some stuff in the works, but not finalised yet. We’re looking for missing tracks. Demos that I made years ago with different people. Things like that, which may be interesting to a lot of people. Looking back at the stuff that we have found, I’m really pleased with what was put down on tape all those years ago. I’m surprised at how Ok they are. They’re pretty good actually! NI ROCKS – Getting back to the current album, we’ll play another track. Do you want to pick one? GRAHAM – What do you think guys? “Dead Man Walking”? Yeah, we’ll do that one. NI ROCKS - Over the years of course you’ve worked with some of the biggest names in rock, particularly when it comes to guitarists, with the likes of Blackmore, Schenker, Malmsteen, Vai etc. Is there anybody in particular that you’d like to have had the opportunity to work with? GRAHAM – Again? I’d love to work with any of those guys again because they’re all so different and inspiring really. They’re all great songwriters and they gave me a new outlook on how to write a song. They are all so different and with each guitar player I’ve written a different kind of song. I especially liked writing with Steve Vai, he was probably one of my favourites. NI ROCKS – Your main focus at the moment is obviously the Graham Bonnet Band and the current album, but Frontiers have a reputation for bringing together classic rock artists to work on specific projects. Is that something you’d consider? GRAHAM – Yeah, if it comes along, why not! I’m game for anything, he said.... lying through his teeth! (Laughs). No, absolutely, whatever musical adventure comes along, I’m ready to do it. NI ROCKS – Do you get much chance to listen to music and what do you listen to when you do? GRAHAM – I never listen to anything. I’ll be very honest with you. I never listen to anything because I don’t want to be influenced by what is going on now. I don’t want to follow trends. I’m not the only one. There are a lot of people that don’t listen to the radio, don’t play their old CDs or whatever. If I do play old music, it’ll probably be from The Beatles, The Beach Boys or Stevie Wonder or something. But very rarely do I listen to music. Once I’ve been working – playing and singing – I don’t want to hear music for a while. I watch TV (laughs). NI ROCKS – I know at least a couple of your band members are active on social media, do you ever get involved or do you leave that to others? GRAHAM – Sort of – ish. But not as much as the other guys in the band. They’re very much Facebook addicts, I’m sad to say. I can’t get their faces out of the screens sometimes. These kids today! What can I say. NI ROCKS – Are those coming to your shows mainly the older generation like myself or are you getting a good turn out from the younger generation? GRAHAM – Yeah, I’ve told this story maybe times. I was signing an autograph in Finland or Sweden for a kid that was 8. I asked him where he heard this music and of course he said, my mum and dad played it... or my Grandma and Grandad. We’re playing grandma and granddad music basicallu; or mum’s and dad’s music! Which I never thought I’d hear myself say that, but that is what this kind of music is to a lot of people. But there is a new generation of people coming up who are listening to it – 20 year olds and 30 year olds. It’s a whole new audience and it’s going full circle. NI ROCKS – Ironically, with all the changes in technology, vinyl is making a big comeback and is very popular with collectors. Have you done, or are they plans to produce, a vinyl version of “The Book”? GRAHAM – Yeah, “The Book” is on vinyl. In fact I signed one today – that is the first time I saw it. I love vinyl. I think it has a better sound and a warmer quality. I love collecting vinyl records myself. NI ROCKS – That is all my questions done, but we’ll finish off by playing another track from the new album. Again do you want to pick one and tell us something about it? GRAHAM – What do you think Beth-Ami? BETH-AMI – Well, I’m fond of “Where Were You”. GRAHAM – Ah, “Where Were You”....wink....he said! (laughs). I like this one. It has a nice little verse with three part vocal. It is about, basically, a guy who was kinda lost and wondering where he might go, when he was suddenly found my someone who fell in love with him. As older guys, we think oh Christ, am I going to be watering plants for the rest of our lives and decorating the Christmas tree alone. Life turned around and that is what it is about. Your life turns around and you think “Where Were You” all my life or whatever. NI ROCKS – We’ll play that. Thanks very much for talking to us. 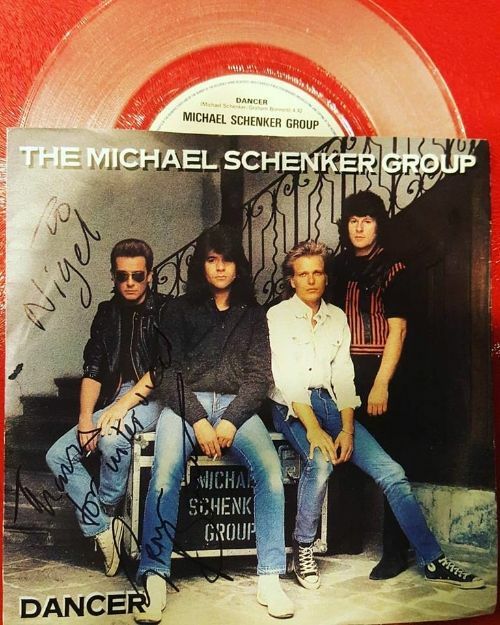 A new version of “Dancer” that was released by the Michael Schenker Group in 1982 appears on “The Book”, so I took along my copy of the single and got Graham to sign it!